This was the first session where we started to move from learning about each other and our locality, to thinking about what we may plan to do together. At this meeting a few were unable to attend. One group member with lived experience, was being treated for an unrelated illness, and another had suffered a close bereavement and would most likely not be returning to the group. This meant there were only three people with lived experience of heart failure, or of caring for someone who has a heart failure. Two of our professionals who had made it to previous sessions couldn’t make it either, one was on holiday and the other person’s work commitments meant she could no longer attend. This meant eight people attended this session when we had anticipated 13 or 14. It’s easy to say, expect the unexpected and be prepared to be flexible – and we were. What’s less easy is dealing with the emotional impact of this, as a group and as individuals. Personally, I also wanted to let the group know that I was pregnant and due at the start of November. This meant that I would only work with the group for one more session. After that, one of my colleagues at IRISS would be taking over my role as project leader and co-facilitator for the group. 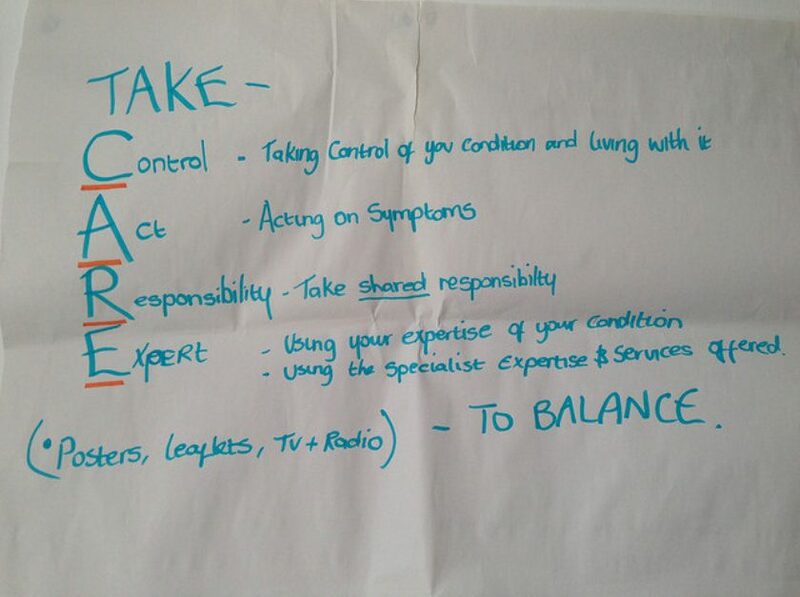 Our plan had been to get the group to share in pairs (then move onto a new partner) top tips for staying well. However, in response to the smaller group size and the emotional impact some people’s absence had on the group we formed a circle by drawing our chairs together in a ring. We used this time to share what positive experiences we had experienced over the summer, those that had made us feel positive about being alive and that we had drawn strength from. Rikke and I (the two facilitators) included ourselves in this conversation. Should you always remain neutral and outside the group? Possibly not, as the group has a relationship with us too. We bring ourselves to every meeting, while conscious that it is the group’s job (not ours) to provide the content for discussions that will shape and drive forward what it is they do. 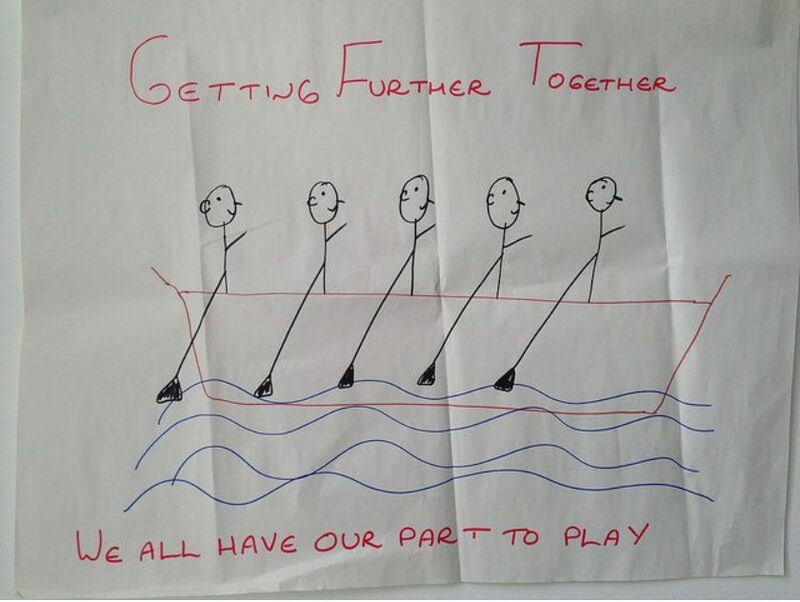 Recap on person-centred care and support: the power of pictures! 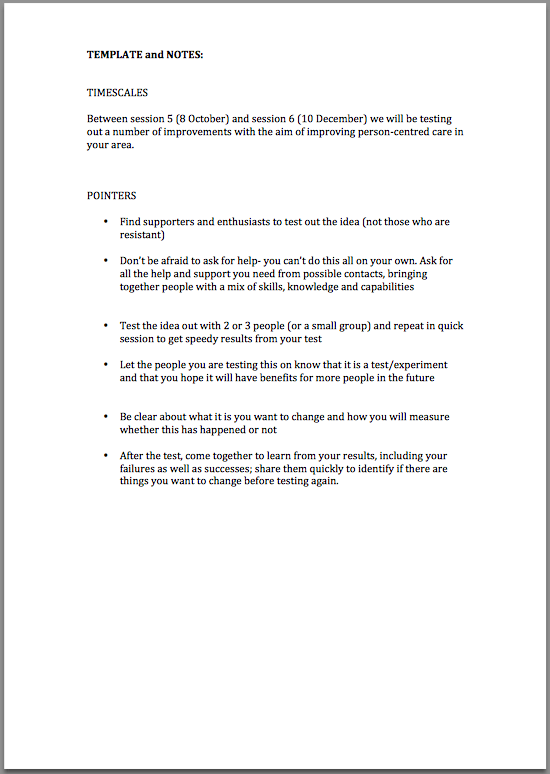 We felt it was important to ground people in what was understood by person-centred care and support before moving on to identify improvement ideas we wanted to trial. 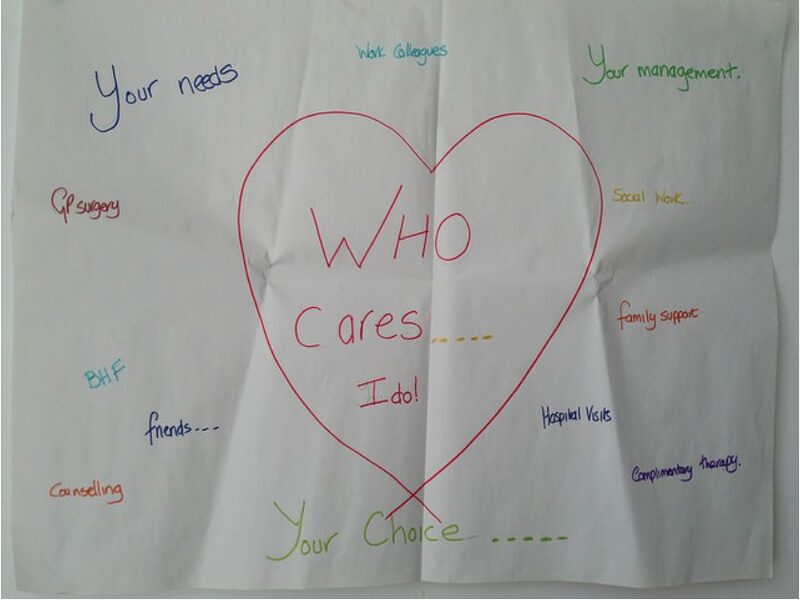 At the last meeting we devised a task to get people to come up with their own person-centred campaign, using the ideas and words to express these that were most meaningful to them. Partly, it was about owning the language. So, we re-played the videos of the groups presenting their campaign ideas. Below are the posters each group created. In this session we used pictures to sharpen and personalise the meaning in these posters. 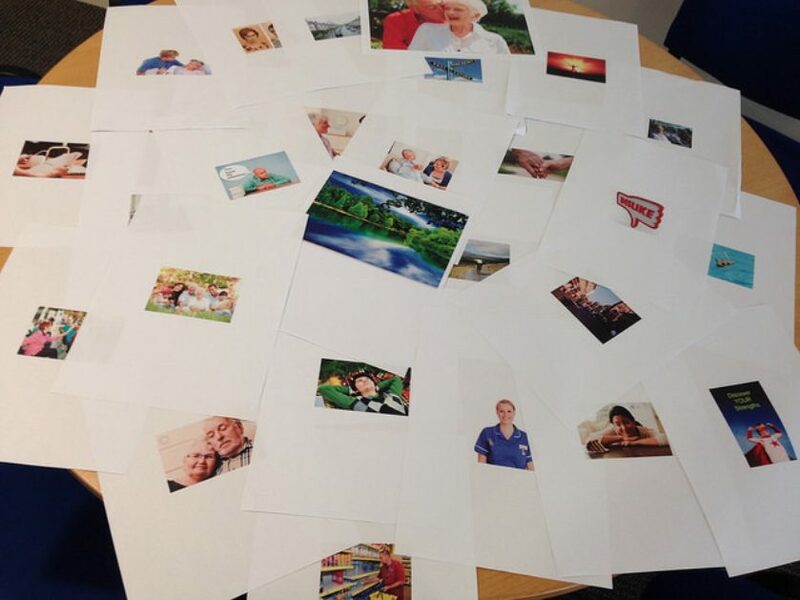 To do this we gave people a choice of 20-30 images and asked them to choose which one which ‘spoke to them’ about person-centred care and support. After people had chosen a picture, we asked them to share what it meant to them. Kerry has written – insert videos. This proved quite powerful and was also a task that people enjoyed. For homework, everyone had agreed to identify resources and supports for the community mapping exercise that had been planned. Rikke and I shared the information provided by those not able to attend. This included information about the Motherwell Locality Support Service (Disability) and Making Life Easier – an online service offering advice, information and direct access to simple pieces of equipment and adaptations for people living in North Lanarkshire. Several in the group agreed that these looked to be useful services and questioned why they had never heard about them before, directly (from practitioners) or after online searches? We discussed whose ‘job’ it was this to make sure people knew this information, and how we could improve access. Questions from this discussion included: Should we have named contacts for particular services? How could these services be more effectively identified online? And how do you figure out a good source of information from one that is not so relevant, full of jargon, may have out of date information or describe heart failure negatively? This conversation supported the group to raise issues of importance to them. Such as needing trusted and relevant information. Consequently everyone seemed keen to get to the community mapping. 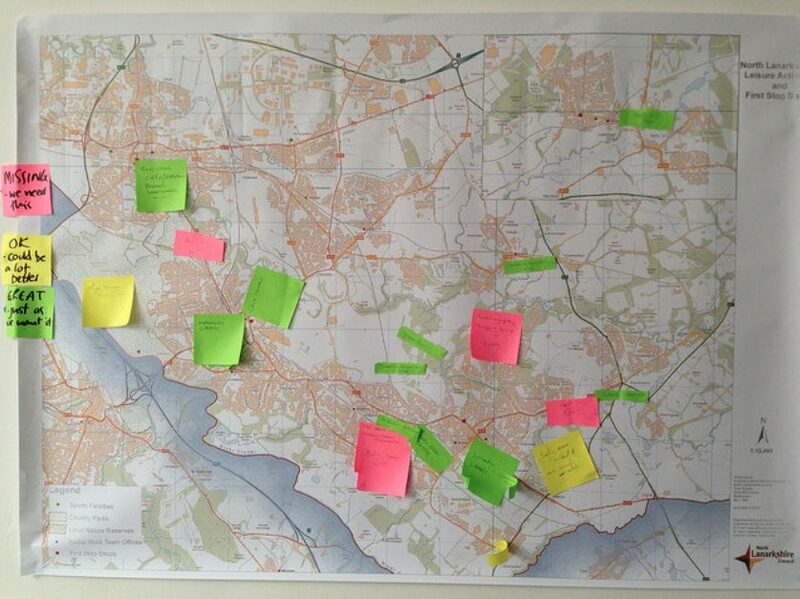 During this exercise we set out to map the assets people perceived in their locality. But what do we mean by community assets? These can be resources, places, activities, businesses or services – as identified by the people who use them to stay strong and well. 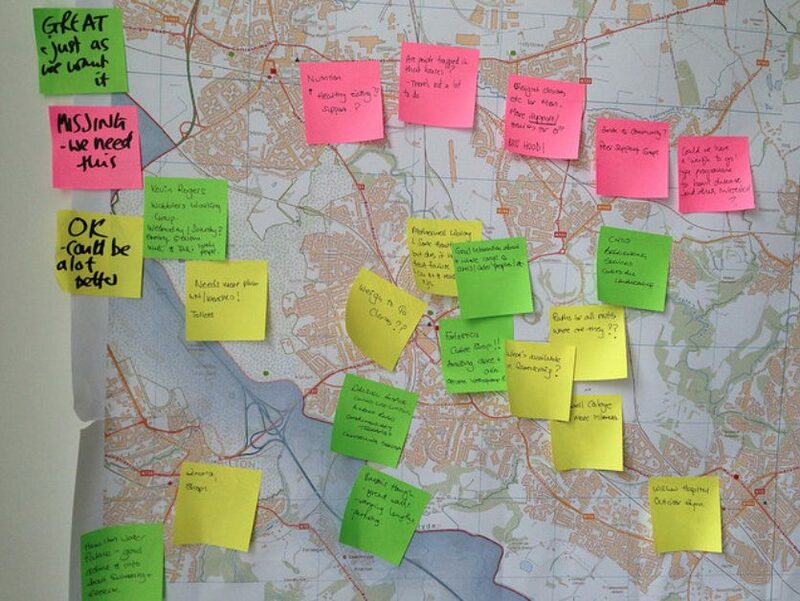 Both groups explored the existing assets in great depth, with people learning from each other what assets make a real difference in other people’s lives, and what types of services and activities were perceived to enhance the area. 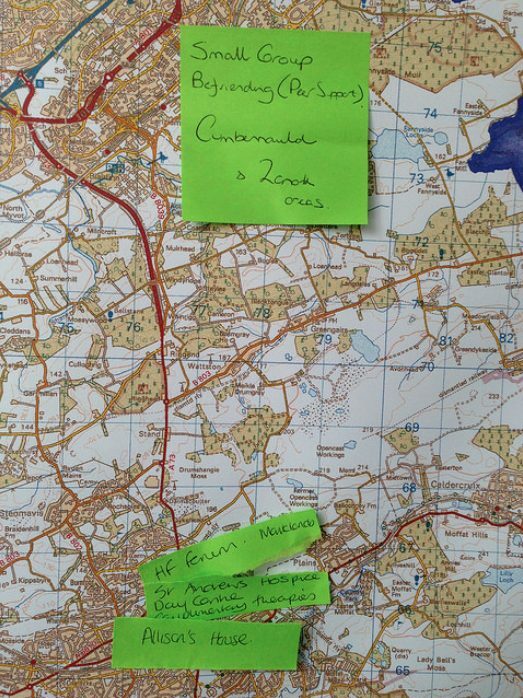 Post-it notes were placed accurately on the maps to provide an overview of the assets in the area. After completing this exercise we brought people together and looked at similarities and differences on the maps. They looked quite different, and maybe one thing they were telling us was that different group members were expert about ‘their own patch’ but not others. Alison mentioned that Voluntary Action North Lanarkshire and Voluntary Action South Lanarkshire had completed a mapping exercise for voluntary organisations which was available online with searchable information and locator tools. 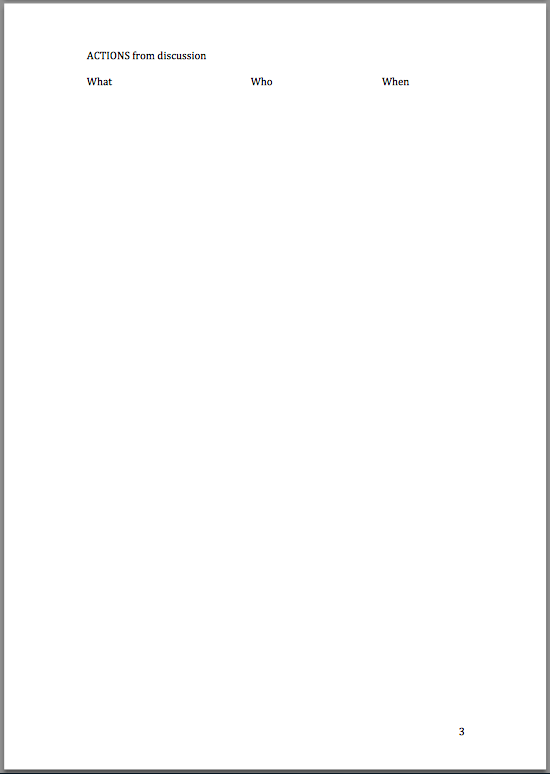 We decided we’d look at this at the next meeting. During our discussion we also spoke about how and when this information could be used. Exploring issues of access, mediation maintaining up-to-date information, and who’s responsibility it may be for doing this. We also talked about ALISS as a tool to support sharing this kind of information. ALISS describes itself as a ‘local information system for Scotland’ for health and wellbeing resources. It is searchable by keyword, location, or within a certain mile radius. Plus everyone can add to it, describing resources as they choose. Exploring whether North Lanarkshire Council could host a similar online map was also mentioned as a possibility. a design exercise that encourages teams to experience simple but profound lessons in collaboration, innovation and creativity. 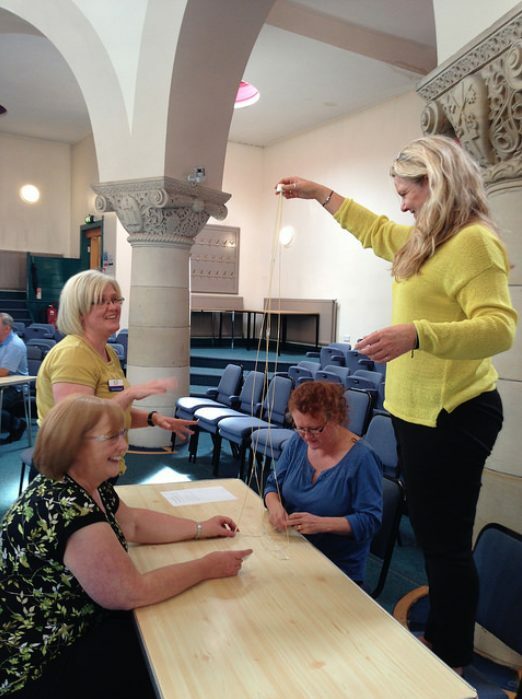 The task is simple: in eighteen minutes, teams must build the tallest free-standing structure out of 20 sticks of spaghetti, one yard of tape, one yard of string, and one marshmallow. The marshmallow needs to be on top. There are also some rules to adhere to- such as not cutting the marshmallow up or holding the structure up when the time runs out! Here’s how our two groups did! 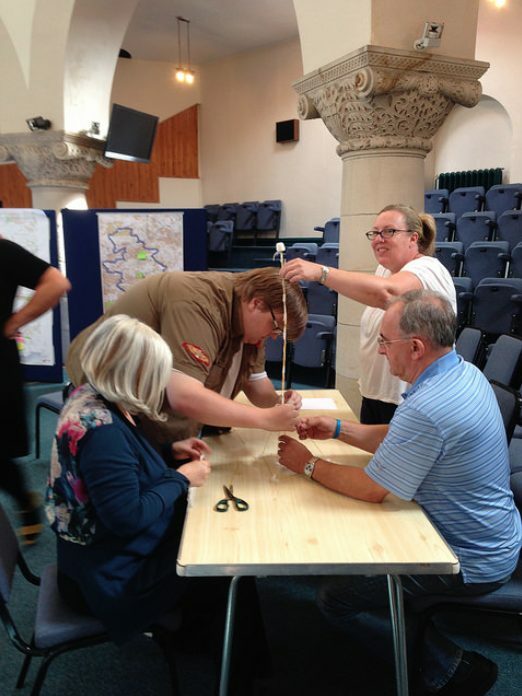 It’s been repeated many times with different groups, revealing surprising lessons – highlighted in these summary slides: marshmallow challenge- lessons. Who tends to do the worst or best? Why? 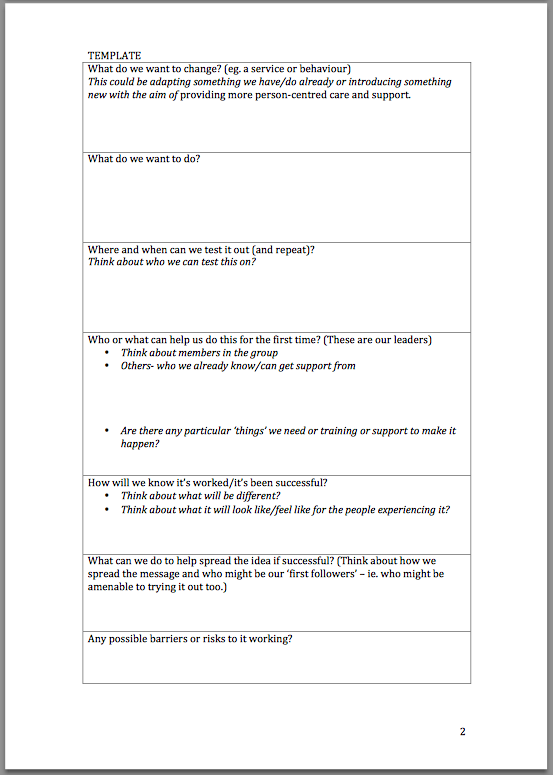 Try it yourself and see what your group finds out about itself and discuss what improves or hinders you being successful at the task! Incentives have a negative impact if people have low skills (and don’t know about the above). If they do, the effect is reversed. We also asked the group to watch this video. I think the video is thought-provoking and identifies certain lessons, including the importance of followers. It takes guts to be a first follower. It’s the first follower who transforms a lone nut into a leader! A follower should be easy to follow too. They need to be public as new followed emulate the first follower, not the leader. The idea behind the video is that a slowly growing movement will reach a tipping point as more people join in and eventually those who haven’t joined in become the odd ones out. This was to be informed by the community mapping exercise we had just completed and the introduction on how to approach improvement. We talked them through the kind of detail we hoped to get to, using a template and notes to guide this. However, best laid plans don’t always happen. 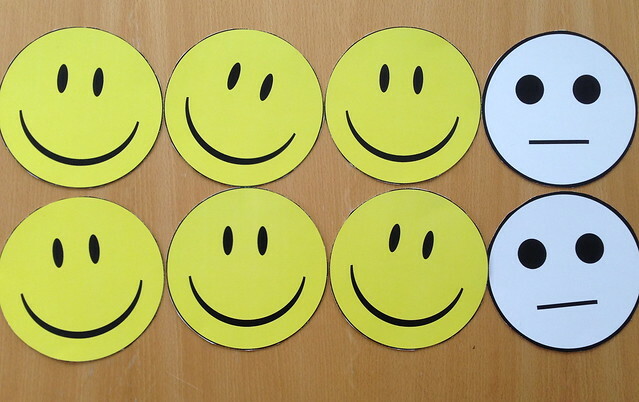 With only eight people in the group, and only three with lived experience of heart failure, we discussed whether we should break into two smaller groups. Instead we decided to attempt the first part of the task as a single group – splitting up into different groups once ideas to take forward had been chosen. But, during the session we didn’t get past stage 1. This may have been because the group was too big (nine people), which made managing group dynamics and time more difficult. Nevertheless, we weren’t inclined to force the group past this stage as we felt we needed to let conversations happen. Lively discussions around what we wanted to change led the group to the following improvement ideas that would require further development. We provided the group with a summary of ‘What we hope to achieve and potential ideas for improvement‘ generated at earlier meetings to cross-check these ideas with out earlier intentions. This arose from the previous activity. We also discussed membership of the group. With the loss of several people with lived experience of heart failure due to ill health, we felt it would be useful to try and redress the balance with the professionals and we still hadn’t given up on trying to recruit a local GP. Try to recruit another person with heart failure or carer to the group to – aiming to find someone who is confident and would be able to slot in quite easily. To investigate creating a digital map of relevant local services for the group, hosted by North Lanarkshire Council. Group members were also invited to contribute to this blog. Volunteers required! 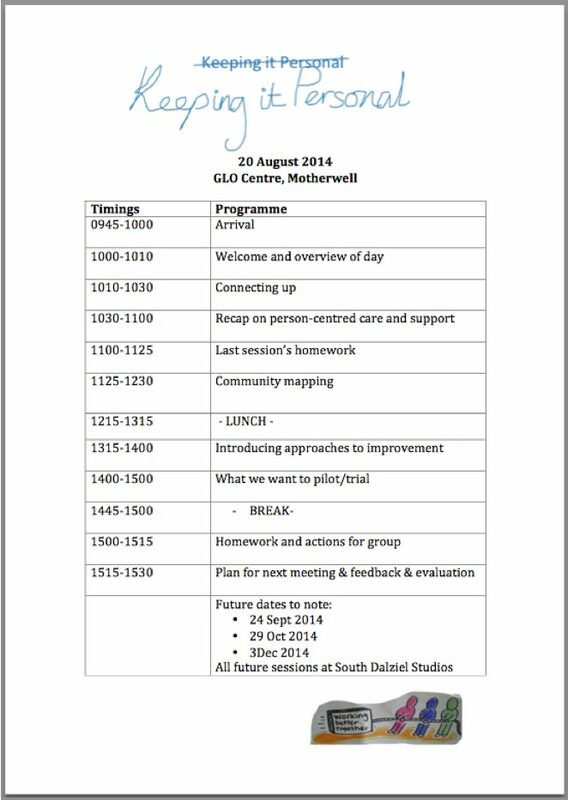 For example it was suggested that this could involve: sharing their own reflections on the project; sharing their personal story of heart failure and what has helped them; sharing their reflections on how person-centred the care they deliver as professionals is; or anything else. This contribution could be written, include a photo montage or be a short film. Of the eight group members, six gave the day a thumbs up. Two were not so sure and explained they had hoped for more definitive outcomes and plans to take away from the day. What will you take away from today?